This classic sporting knife features a wood handle inlaid with a nickel silver Colt® shield. Overall length is 7 3/4", with 3 5/8" 440 stainless steel bead blasted blade with wood handle. Full tang. Includes a very nice Brown genuine leather sheath with quick-release snap. 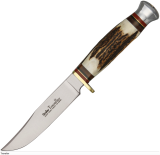 Linder Traveller II - Traditional style hunting knife.